On March 28th, 2019, Brothers Dustin Reid and Jamie Moore received their Fellow Craft Degrees. Congratulations on the steps these two Brothers have taken! Inman Masonic Lodge hosted a pot luck dinner on Friday, March 22nd. Over fifty people were in attendance for the food and fun. Many delicious dishes and desserts were on the menu. After dinner, a 50/50 raffle was held, and bingo was played for many prizes, as well as a few items being auctioned off. A part of the proceeds from the night’s event are to assist Brother Chad Pinker. He and his wife Sarah have committed to adopting four children whom they are fostering. In order to do so, they need an addition onto their house to accommodate their growing family. Congratulations to WB Stephen Parris and his officers for hosting this evening of fun! Attendees of the pot luck dinner enjoying a night of bingo! One of Inman Masonic Lodge’s very own, Brother Steven Setzer, has returned home after a hiatus in sunny Florida. We at Inman Masonic Lodge welcome Steven back with open arms and are excited that he has returned home! We missed you, Brother! We are happy you are back! On January 22, 2019, Brothers Dustin Reid and Jamie Moore received their Entered Apprentice Degrees. One of the missions of Inman Masonic Lodge is community service. In the past, the Lodge has had members visit the area nursing home facilities during Christmas to give gifts to the residents. Brother David Fisgus took up the mantle this year and delivered gifts to about eighty residents of Golden Age, Inman Healthcare and Magnolia Manor. Brother Fisgus prepared gift boxes for the men and ladies of these facilities. They included socks for the ladies, thermal or tube socks for the men, toboggans with some of the ladies instead receiving throw blankets, crossword or word search puzzle books, personal hygiene and toiletry items and assorted candies. These gift boxes were made possible by a generous donation from the members of Inman Masonic Lodge, as well as dental hygiene items donated from local dentists, toiletry items donated from Brother Fisgus’ co-workers, various items donated by Brother Carl Webb, and the throw blankets from an anonymous donor. 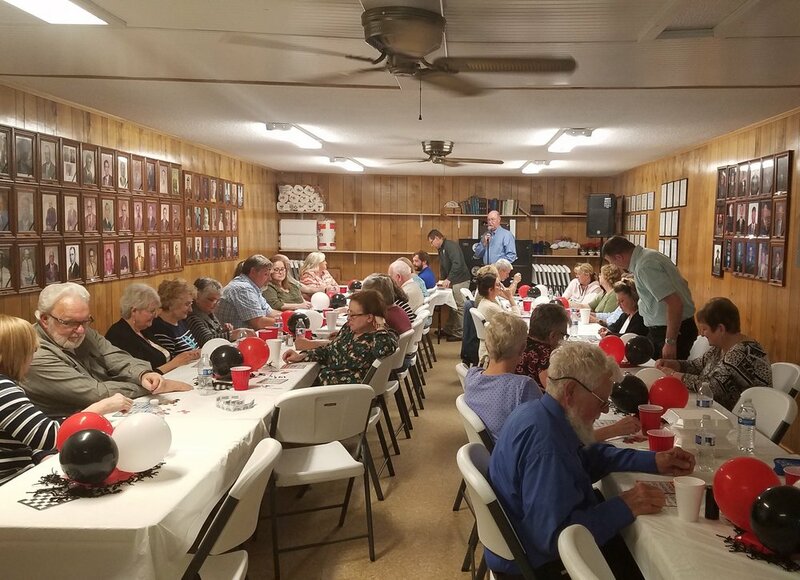 Ladies Night was held at Inman Masonic Lodge on November 10, 2018, with forty-plus people in attendance. Brother Ray Pack’s party of sixteen included eight wives of Masons who have since passed on. An invocation was made by RWB Doug O’Shields, then everyone enjoyed a catered meal. Awards were then presented, where Brother Carl Webb received the Mason of the Year Award for 2018, and Brother David Fisgus received the Master & Wardens 150% Award. Service awards were presented to Brother Ed Lynch for 60 years of service to Masonry, and to Brother Ray Pack for 50 years of service. After the presentation, the attendees were invited to play bingo for many prizes that were up for grabs. Thanks to Worshipful Brother Ken Kuszmaul and his officers for the splendid evening. At the November regular communication, elections were held for the officers of Inman Masonic Lodge for the ensuing Masonic year. Brother Stephen Parris was elected to serve as Worshipful Master for 2019. Brother John Woodyard was elected to serve as Senior Warden, and Brother Jared Miller was elected to serve as Junior Warden. RWB Doug O'Shields was elected to serve as Treasurer, and RWB Paul McWilliams was elected to serve as Secretary. Brother Carl Webb was appointed to serve as Senior Deacon, and Brother Gene Michael Kuszmaul was appointed to serve as Junior Deacon. Brothers David Fisgus and Hunter Webb were appointed to serve as Stewards. WB Stephen A. Pinker was appointed to serve as Tiler, and Brother Jason Murphy was appointed to serve as Chaplain. Congratulation to all these Brethren on their elections and appointments. Inman Masonic Lodge continues to be held in good hands! On October 18, 2018, Brother William Tyler Owens received his Entered Apprentice Degree. On November 20, 2018, Brock Johnathan White received his Entered Apprentice Degree.